Oh my goodness. It was so, so good. It was such a splendid movie, and I was so surprised, enjoying it so much. I had thought, before watching it, that the actors would be dull and insipid next to those splendid ones in the Emma Thompson version. In fact, I was perfectly certain I would find it a great deal less entertaining than the 1996 version. But I was wrong. I loved it as much. As much. Perhaps even more. Yep, even more. Which says a vast deal indeed, for I am a very big fan of the Emma Thompson version. All right, I'll admit it. This chap is the reason I wanted to watch it. Dan Stevens acts Matthew Crawley and now Dan Stevens acts Edward Ferras, a Jane Austen hero. I had to see that. He's my favourite actor, for goodness sake. And oh me, I am SO glad I did, for he was absolutely brilliant. Sure, Hugh Grant was very good, and very kind and shy and I liked him, but I never really loved him. Something lacked with Hugh Grant in his performance. 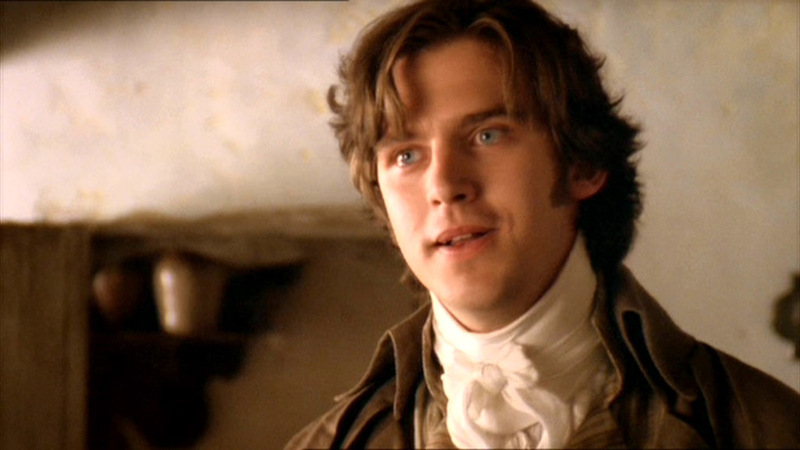 Dan Stevens was just so good as an Austen hero. I was so surprised! He was so... gorgeous! I just LOVED him. He was just like Edward Ferras in the book, just like he should have been. Really, perfect. I felt so sorry for him, the only nice person in such an horrendous family- obviously his father was like him, and he the only one resembling him. Imagine having a mother such as his! A sister such as his! A brother such as his! I felt so sorry for him, I wanted to run over and give him a big hug. Need I say more? THAT SMILE. Enough, Naomi. He isn't as shy as Hugh Grants performance and I like that- skips all those awkward silences and squirming moments, which I don't particularly like. He smiled more than Hugh, and he just was, to be blunt, more like I feel Edward should be. And so kind, he's so kind. So considerate. Eeek, I'm in love. The only thing I have to point out is that his hair needs a good cut. It's all floppy and bushy. But still, he was amazing. Dan Stevens really hit the nail on the head. Seriously, just perfect. A new favourite hero which made me fall head over heels in love. Bravo. I could watch the Edward scenes all over again right now. I'm sorry, but even though this picture has nothing whatsoever to do with S&S I had to add it. I found it and I squealed because this gif is just too charming for words. Oh my word. The funny thing was that Eleanor sounded like Mary Crawley- she had a beautiful, rich, ripe voice which I just loved. Again, here the only issue I have about Eleanor was the hair. Those flat, long bangs just look too modern. Period. But for the rest, I just adored her. I am really sorry to tell you folks this, but I actually preferred her performance above Emma Thompson's. Wait! Before you start bawling, please listen to my explanation. Firstly, Hattie looked the right age. Seriously, Emma Thompson was too old for her role, because Eleanor is nineteen and not twenty-seven. Hattie looked nineteen, she was pretty and just like Eleanor should be. Sensible, but fun. Don't kill me readers, but I thought Emma Thompson's Eleanor wasn't really... fun. She was so sensible I really wanted her to do something silly so that I could see the reaction on her face. She was so good that it almost made me uncomfortable. Not as badly as Elsie Dinsmore, of course, but still, on that path. Hattie's Eleanor was sensible but fun. For example, when she beat the carpet with the carpet beater extra hard in frustration. That showed you she was a real person. And when Marianne asked her if she was engaged to Edward and Margaret said 'Me too' from the tree, she shook her head laughingly. I loved her very much indeed. Oh my goodness, I just loved the Edward-Eleanor scenes. They were just so sweet and modestly romantic. I just loved the way Edward came up and said, 'Beating carpets?' and then, 'Would you like me to help you?' He's such a gentleman. And I just LOVE the way he leans on the swing rope and looks at Eleanor. Oh dear, this is just perfect. And the proposal... the proposal. Oh, THE PROPOSAL. And the kiss... oh, suffice to say I loved it. Her giggles were a trifle weird, but it just added to the real joy and happy, joyful outburst. I have never been excessively fond of Emma Thompson's everlasting sobs. I love the proposal scene with Emma and Hugh, but this one, I must say, was more to my liking. So, long story short, I adored Eleanor and Edward so much I could go on and on gushing about their adorable relationship, conversations and looks. I thought they were simply, smashingly perfect and find it heart-warming merely to look at them. I love you Eleanor and Edward and I wish you were real. Jane Austen is amazing. I wish at least one version had stuck to the book, though. In the book Margaret is thirteen, passionate, romantic and acts far more grown up. But this Margaret is closer to the book than the other one, so I prefer her. But in any case, I loved Margaret- she was great fun, as usual, always making silly remarks such as, 'If you like it so much, you can go and live there, Fanny, and we will stay in Noorland.' Tell her, Margaret, tell her. But where was the F scene? F-major and all that. I wanted Margaret to come up and tell Miss Jennings that Eleanor has a suitor and 'his name starts with an F.' But they skipped it. Really. My favourite scene. They also skipped the 'Like him! Esteem him! Use those insipid words once again and I shall leave the room this instant!' bit. They had Eleanor say 'I like him' but no Marianne thunderstorm after it. I must say, I was not pleased with Marianne. Kate Winslet remains Marianne. Kate Winslet was graceful, beautiful, pleasant and completely passionate about everything. Sure, she cried a lot, but that's just how Marianne should be. This Marianne was, to start with, not beautiful. Not even pretty. Plus, she was whiny and always complained. Nope, give me Kate Winslet. But, I must say her bun is really pretty, and her hair didn't look like a wig. But then she wore it loose sometimes in public. People!!! Seriously! Colonel Brandon definitely was an improvement. I have never been very fond of Colonel Brandon, especially not in the 1996 version. Sorry people (sorry Evie! ), remember this is merely my opinion. Firstly, I think he's too old for Marianne. Period. Seriously, seventeen and thirty-five- imagine marrying someone who was eighteen when you got born? Someone who is five years younger than your mother! In the 1996 version it looks even more extreme, for there Colonel Brandon looks even older than thirty-five. He looks fifty, or at least forty. And Alan Rickman's Colonel Brandon is far too serious and he doesn't smile much. I liked this Colonel. He was handsomer, he smiled more and he seemed younger than the other one (although the actor was older than thirty-five when he played it). I still don't really love him but he was a great improvement, I think, and I greatly rejoice over that. Shudder. Whilloughby was awful. Absolutely awful. No seriously, Greg Wise was much better. Dominic Cooper's Whilloughby looked so villainous and crook-ish from the start. And he wasn't handsome at all, I am sorry to say. He had slimy hair and looked awful- looks a bit like bat-man or someone like that. Shudder. I always thought Greg Wise was annoying, but he just was because he's Whilloughby. This one is annoying... not only because he's Whilloughby. There are lots of reasons. This. Boy. Was. Hilarious. He should have won an Oscar. That's what I really loved about this version, they didn't scratch out all the minor characters. Henry Dashwood was there (not starving), Sir John Middleton was there with his insipid wife and spoilt children, and Lucy Steele had her sister. That's what I like, lots of different characters. They even had Mrs Ferras! Haha! I thought Lucy Steel was better in this version. More likeable, prettier and less of a foxy, proony, witchy girl. One could almost understand a young Edward accidentally falling in love with her, and I couldn't with the 1995 Lucy Steele. And Anne Steele was SO funny. "Oh! It just popped out!" I've been quoting that sentence like mad lately. But then there were characters which were really nothing next to those in the 1995 version. I thought Mrs Jennings here was just... not good. 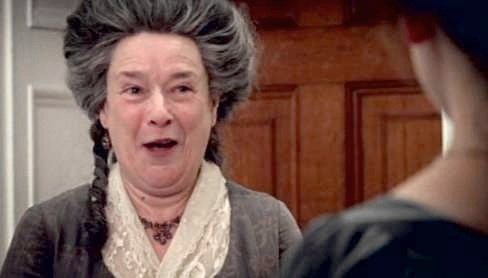 I want a big, vulgar boost who bursts in every room jovially, like the one in the book, and only the 1995 Mrs Jennings did that. This Mrs Jennings seemed too calm... you know.... I can't really explain (as you are probably noticing). Maybe the cause for this was because I recognised her as the frail and clever Queenie in 'Lark Rise to Candleford'. 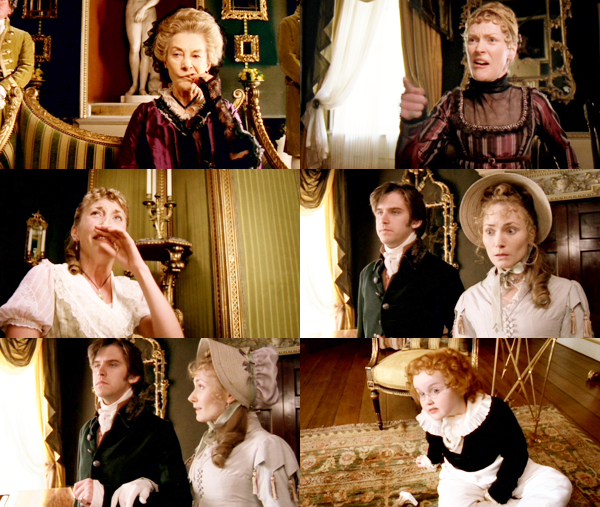 Sir John Middleton was nice in his own way, but nothing next to the plump merry fellow in Emma Thompson's version. Never as good as Hugh Laurie and Miss Pole. I knew that from the start, and it's true. Never ever. No-one, no-one will ever be able to perform Mr and Mrs Palmer better than they. The following gif proves that statement with all certainty. See what I mean? They didn't even try to try because they knew they would fail and tried to ignore them as much as possible. No one can ever be better than they. It is impossible. Hugh Laurie IS Mr Palmer and Imelda Staughton is Mrs Palmore. The end. The costumes weren't much to brag off, and the scenery was pretty and very... um, spectacular. But all in all I loved it so much and I'd certainly watch it again soon! I think Jane Austen stories are always better when they are longer and with all the story-bits in it. Emma Thompson left out to much and made her own little version. But she did a good job too.... I love them both. What did you think of Sense and Sensibility 2008? Yes, to so many of your points. Elinor was younger like she was supposed to be and Edward was not nearly so awkward. I think he should have been more shy since that is how the book described him, but in the 1996 he WAS SO AWKWARD. The scenery was brighter and prettier in this newer version. And that is about all that I think is better because overall this movie was too modern feeling and the Marianne and Willoughby were so wrong (and I though Edward and Elinor acted more modern too). Willoughby was not supposed to look bad, good grief he was the charming bad guy. I think he is handsome but not in this role. Despite the wig, Kate Winslet is Marianne. This Marianne was not pretty nor a good actress. My mom love the "it just popped out" scene. I agree with a lot your points, but I feel that the other one was more accurate overall in tone. I just wish we could put this Elinor and Edward in, make them a bit more accurate, this Margaret (the 1996 was too tomboyish, the Margaret in the book was not) get an entirely new Colonel Brandon (he was too old in the 1996 version, the actor was 50 then I think, and the newer one just creeped me out) and then there would be a perfect Sense and Sensibility. Daaan! Yes I watched it because he was in it too. Yes her hair! 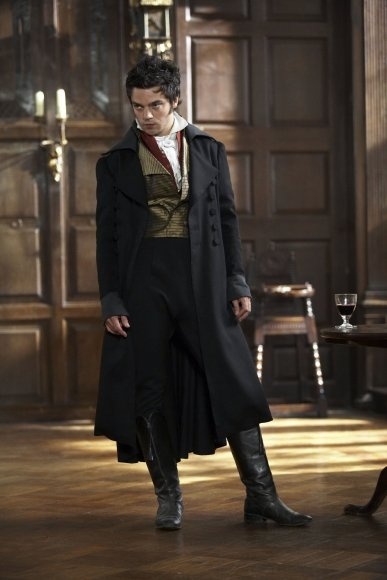 I agree, it could have been a bit more regency.. yes? The Proposal?! Perfection! It had me tearing up, then sobbing.. thanks ever so much Andrew Davies..
F Major bwhahahah! I loved that scene in the other version.. Yes to the rest of your points!! :D and thatfirstscene I don't see hy it was nessescary. Did your version have Brandon visit Eliza? Mine didn't but I have heard about that scene and was curious. Ok this version My favourite character was.... Edward! this review and me watching it again has actually consolidated the fact so well done on a fab review! I'm glad you agree with me on Elinor, because I thought I was the only one! You are perfectly right, Mne and Whiloughby were just WRONG. Kate Winslet is Marianne. Precisely. I think this version is more accurate to the book because it has more of the story and all the characters, but I see what you mean though. The other one is more... well, Jane Austen. Haha I knew you'd write a long comment! Thank you! Yes we did see the scene where Brandon visits Eliza. It was very sweet, and I'm glad they added it. Finally I have found someone who actually likes this version as much if not better than the 1995 version! I watched the 1995 version when I was really young so when I watched this version I had no expectations (or lack thereof) When I watched this version I totally fell in love with it! 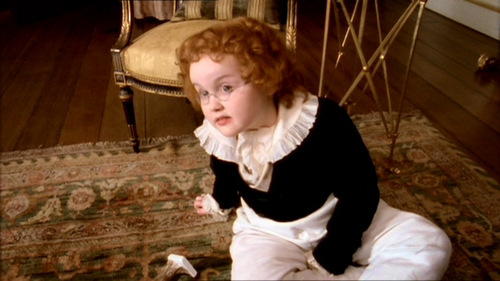 I agree with everything you said about Edward and Elinor. I fell instantly in love with Hattie Morahan! I never cared for the Hugh Grant though. David Morrissey was the perfect Col. Brandon! And he definitely looked lots younger then Alan Rickman. And Anne Steel. My sister and I would always say to each other..."It just popped out!" And that scene when she says that...perfection! I laughed so hard! I see what you mean with Marianne, and I agree, they did show the Whilloughby to Col.Brandon change MUCH better. I still think Kate Winslet is Marianne, though. I know! The 'It just popped out!' scene is hilarity! Hahahha you know me too well then! Yes I felt I had to write such a long comment. XD. That second GIF oh that second GIF! I went all goo goo and my brother thinks I am weird ahahah i said "I'm not wierd I am just fangirling... to which he goes "definitely weird"
it's cool! really I really prefer edward in this version too!! It seems that everyone is watching or rewatching this lately! It has been a while since I have seen it, as I only watched it with my Mum a couple of years ago. I shall have to watch it again! But I do think that although Alan Rickman and Emma Thompson were both too old, they played their roles really, really well. But I must disagree with you about Marianne. 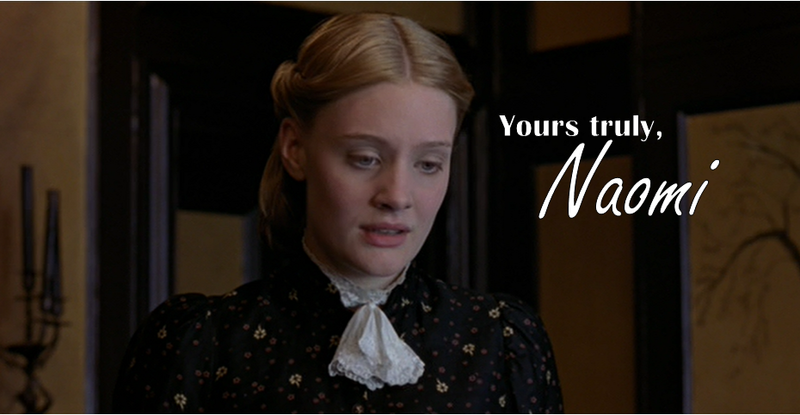 I don't really like Kate Winslet as Marianne. BUt I can't remember this Marianne very well either, so it may just be that I don't like Marianne at all! Sorry to be commenting so late--I just ADORE this movie and wanted to say, I really enjoyed your review! I totally agree about Elinor and Edward--they were both much better in this one. I really did like Emma Thompson's character in 1995, but I couldn't really see her as ELINOR--she was just too old and careworn. Elinor is supposed to be young and strong and hardy, in my opinion. And Dan Stevens just did a brilliant job showing Edward's strong feelings and reserved nature at the same time. That scene in the rain--oh, golly, I almost cried, and no, it had nothing to do with the wet shirt! He just seemed so doggoned SAD that my heart was just bleeding for him. I have to say, I really liked the way they did Willoughby in this movie. I know that sounds weird, since he was so awful and slimy--but I actually think he was more realistic that way. I know Jane Austen SAID he was handsome and charming and romantic and super-cool and all that, but I think that a person who did the sort of stuff Willoughby actually did would be a much worse person inside than the book-Willoughby seems to be--and that it would show on the outside, too. Yes, I know even awful people can be handsome and attractive--but the 08 Willoughby WAS handsome and attractive, in a way. He just didn't look or act like the Ideal Romantic Hero, but I like it better that way. Does that make sense? Y'all don't have to agree with me. It's just what I think personally. and I agreed with most ;) or what you said, but especially that the little red head boy should have won an oscar. I love him! He is so funny. Thank you for always brightening up my days with your fun, delightful, witty posts. Ask me anything ~ Answers! // Yes, I'm back!